Chengde, lying in the northeast of Hebei Province, is close to Beijing, about 230 kilometers (140 miles) away, Tianjin, Tangshan and Qinhuangdao. The topography of Chengde is mainly divided into plateau and mountainous regions, including Yanshan, Yinshan and Qilaotushan mountains, as well as the Luanhe, Liaohe, Chaobaihe and Jiyunhe rivers flowing through the city. Chengde, originally called Rehe was once the summer resort capital of the Qing Dynasty (1644-1911). It holds rich culture related to this history as well as many historic relics dating as far back as the Neolithic Age in this city. Ethnic groups such as Xiongnu, Xianbei, Qidan, Nvzhen, and Mongolian once led a nomadic existence in this region from the Qin (221BC-206) to the Ming Dynasty (1368-1644). As one of the first famous historic and cultural cities of the nation, Chengde has plenty of sceneries, with some of them being renowned both at home and abroad. The Mountain Resort and Eight Outer Temples are listed as the world cultural heritage sites, which have contributed towards Chengde being one of famous cities in the world. 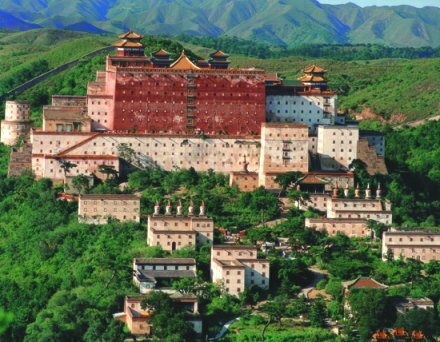 Both the internal and the external transportation of Chengde are very well developed and although there is only a small-scale airport, chartered flights flying between Beijing and Chengde will provide you more choices for your journey. In addition, railway and road links can connect you to many cities, such as Tianjin, Shenyang, Baotou, Ulanhot, Liaoning, and Inner Mongolia, etc. City buses provide a fine and integrated transport service; taxis are also a good choice due to their convenience and inexpensiveness. With a pleasant climate, time-honored history, beautiful natural sceneries and historical sites, Chengde well deserves its position as one of the most famous tourist cities in China. It is an ideal place for sightseeing and hunting, as well providing welcome relief from the summer heat. Just as the Terra Cotta Warriors and Horses is the key scenic spot in Xian, the Mountain Resort of Chengde, the largest royal garden in China is the hot place of interest in Chengde. 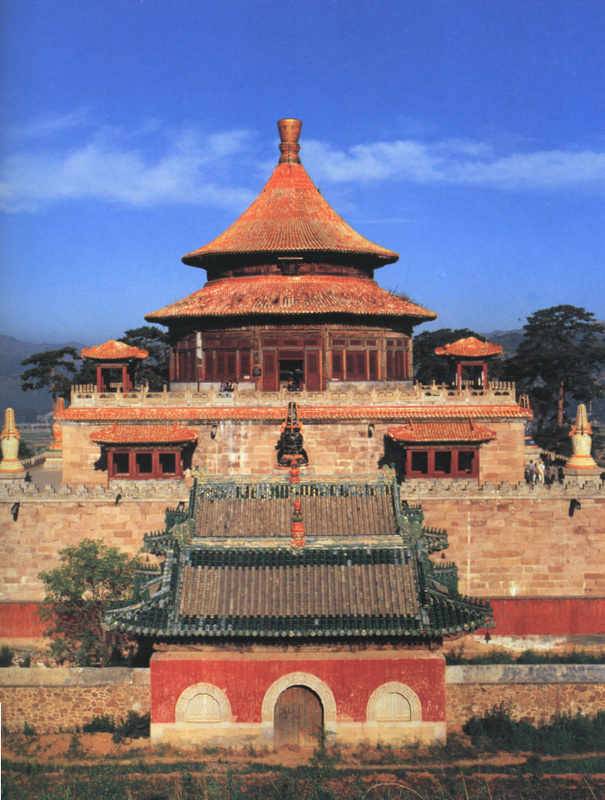 To the east and north of the Mountain Resort are the Eight Outer Temples, the largest cluster of royal temple in the world, with the architectural styles including the Han, Mongolian, Uigur and Tibetan, etc. 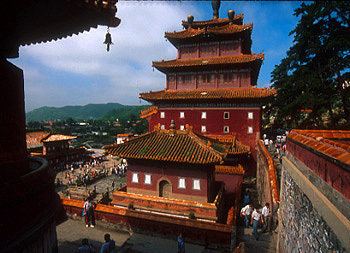 UNESCO listed the Mountain Resort and the Eight Outer Temples as a world cultural heritage site in 1994. The Kuixing Pavilion is a tourist spot newly that was built upon the foundations of a former, ancient pavilion that had fallen into ruin. It is located atop Banbi Mountain in the south of city, the three main areas of this complex comprise a palace, square and garden zones. The whole architectural style is bright and colorful, and some cultural sights can still be seen in this beautiful scenic spot. There are also many forest parks in and around Chengde, including Qingchuifeng and Liaoheyuan National Forest Parks, Beidashan Stone Sea Forest Park, and Liuliping Forest Park, etc. The Qingchui Cliff National Park, lying to the east of the city, is a natural par k that features with a dramatic, lofty and steep formation called the Danxia Landform. The highlight of the park is the Qingchui Cliff, which is nearly 60 meters (197 feet) high and looks like a wooden club in the upper part. More than 100 species of wild flower, including rhododendron, peony, rose, lilac, cherry, and pinks, etc. can be found all over this area creating an intoxicating ambiance of scent and color. If you are interested in horse riding or hunting, you may well enjoy Mulan Imperial Hunting Park situated in Weichang County. It is cool in summer when you can enjoy riding, gathering mushrooms, and grass sliding; while in winter it is covered with snow and is a good place for both hunting and skiing. Shuangta Mountain, Jingbei No. One Grassland and Jinshanling Great Wall are all in or around the city are of tourist value likewise. The story of local food in Chengde has a long and interesting history, going back to the Qing Dynasty (1644-1911). Cooking culture of both royal and folk converged in Chengde after the construction of the Mountain Resort. Then it gradually formed its own feature after an amalgamati on of a diversity of other diet and an innovation of new tastes. The dishes of Chengde are representative of court dishes in the north of the Great Wall. Being far removed from Beijing, venison can be found without effort in Chengde. In addition, there is food of Manchu features, glutinous and cold as Chengde is place where Manchu are gathered. Red bean gruel, Youmian (a kind of food made of oat flour) and hot pot with Chinese sauerkraut are popular in this city as well. Dining in Chengde demands that the color, smell, and taste of every dish be superb and there is a diversity of the culinary skills like frying, sauting, heating up, braising, and fumigating, etc. Some famous dishes in Chengde are five spiced venison, game hot pot and chilled hare of Pingquan, etc. 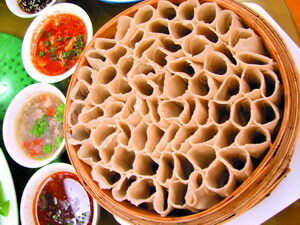 The flavor snacks include crisp cake, eight-treasure rice pudding, bean-starch jelly, haw sheets, nansha cake, and Shaomai (steamed dumpling with the dough gathered at the top), etc, all of which are of unique local style. The city of Chengde, lies to the north of the Great Wall, and teems with a variety of local products due to its abundant natural resources. In addition, its profound cultural heritage has contributed to the citys unique folk arts and crafts. While traveling in Chengde, you are provided with many options should you wish to buy local specialties or just do some leisurely window shopping. The special natural products to be found in Chengde are wild almonds, walnuts, Chinese chestnuts, hazelnuts, mushrooms, hawthorn and nasturtium, etc. The almond juice made from wild almonds has distinct aroma and leaves a pleasantly lingering aftertaste, which is well known at home and abroad. The Chengde mushrooms come in a variety of species and these are not only widely sold in China but also throughout Asia and Europe. 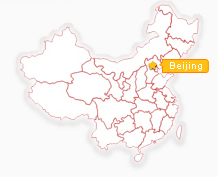 Most of this produce can be found in Kangqian Tourist Shopping Mall which is located at B1B, Rongji Garden, Puning Lu. One of the most popular products with tourists visiting Chengde is Tengs Cloth-Pasted Painting which is regarded as a unique talent of Cathay. It is a new style of painting combining brushwork with sculpture, embroidery, paperhanging and paper-cutting, an art form invented by the folk artist Teng Teng. These attractive paintings can be hung on the wall or laid on a table as a truly perfect decoration. Chengde woodcarving is another of the famous craft works. Walking sticks, furniture, screens and other handicraft made from rare wood from the mountains are elaborately wrought by the wood carvers. Paper-cutting in Fengning County, silk brocade and tablets of the Mountain Resort, porcelain carving, calligraphy and painting, as well as jade pillows are also characteristic souvenirs of Chengde.